Connect a DVI display to a Mini DisplayPort-equipped PC or MAC. The MDP2DVIMM6 6-foot Mini DisplayPort to DVI Cable is a cost-effective Mini DisplayPort to DVI link that lets you connect a DVI monitor to a PC or Mac with a Mini DisplayPort output - saving the expense of upgrading the monitor for compatibility. This Mini DisplayPort adapter is the perfect accessory for any of your MacBook or Microsoft Surface Pro devices with mDP. 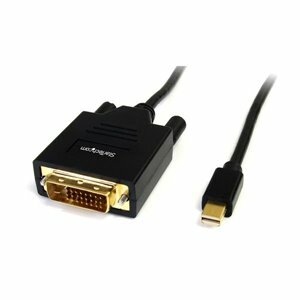 This all-in-one, easy to use Mini DisplayPort/DVI cable requires no additional converters or adapters, and no driver or software installation.Compatible with Intel Thunderbolt, when connected directly to a supporting DisplayPort over Thunderbolt I/O port.MDP2DVIMM6 is a passive adapter that requires a DP++ port (DisplayPort++), meaning that DVI and HDMI signals can also be passed through the port. This all-in-one, easy to use Mini DisplayPort/DVI cable requires no additional converters or adapters, and no driver or software installation.